This product requires the base game Dungeons 2. On a tour of the world of Dungeons 2, the widely-traveled Dungeon Lord finds itself in a scorching desert in the blazing new DLC "A Song of Sand and Fire". An insane priestess is on the loose, burning anything and anyone at the stake. 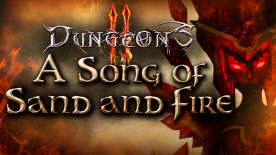 Will the possibly-flammable Dungeon Lord and it‘s minions also fall victim to the flames? Or will the Great Evil One be able to survive this ordeal and save itself from an untimely, charcoal-broiled end? Dungeons 2 is required to play this DLC.